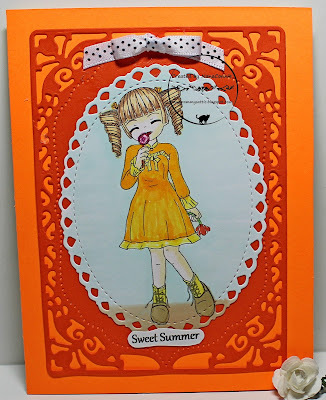 I colored the image with my ProMarkers, using warm & bright, summery colors, and then cut it with one of my newest Spellbinders dies. The frame was cut with another new die and, while the two dies I used are from completely different companies, they work so well together you'd almost think they were both from the same Spellbinders set. I wish I could tell you more about that second die I used for the dark orange frame but it's one of those "Unbranded" dies, sold by an online company I recently discovered where dies are sold at two-thirds to one-half the price of other dies. When they arrive, they are packaged in simple cellophane bags with no brands or markings of any kind. But they work just fine! I tied a simple bow, using polka dot ribbon, then printed and cut the sentiment. The frames were so detailed that I felt they should be showcased instead of adding more embellishments. Gorgeous card Connie, I am so loving the warm colours which are some of my favourite. The image is beautifully coloured too. Lovely card Connie, love to see the colour orange as it is a relatively unused colour. You seem to handle all colours very well. The die cuts are fabulous. Such a pretty card! Thank you for sharing your card with ATSM! Your card is hot, hot, hot, even though you may not like it in the Summer, it is fabulous on your card. Very cute card and image thanks for sharing!!! Nice work. Thanks for joining us at The Crazy Challenge. Good luck. Flowers Just for You, Mom!